Sep 27, 2005, 17:59, Reviewed by: Dr. The problem is that a lot of people don't enjoy many of the foods that are high in fibre, like fruit and vegetables, yet to consume the recommended daily amount of fibre they would have to eat a lot of these types of foods. By University of Newcastle upon Tyne, The highly-fibrous seaweed extract, alginate, could be used to increase the fibre content of cakes, burgers and other types of food which usually contain large amounts of fat and a low degree of healthy nutrients, say British scientists. Scientists at the University of Newcastle upon Tyne publish their findings in the academic journal Critical Reviews in Food Science and Nutrition, in a paper detailing alginate's many benefits to the body. The research paper examines the properties of a brown-coloured seaweed called Lessonia and Laminaria, found in the Far East, South America and parts of Norway and Scotland. The seaweed is processed in the laboratory to produce the extract, alginate, a carbohydrate compound which is a tasteless and odourless off-white coloured powder. The paper shows that alginate has been proved to strengthen mucus, the body's natural protection of the gut wall, can slow digestion down, and can slow the uptake of nutrients in the body. Moreover, alginate is high in fibre and has been proved to be palatable and safe, and as such is already in widespread use by the food industry as a gelling agent, to reconstitute powdered foods, and to thicken the frothy head of premium lagers. Studies have shown that eating high-fibre diets can help reduce the incidence of diseases such as bowel cancer. Good sources of fibre are fruit and vegetables, brown bread and cereals like bran flakes. One of the research team, Professor Jeff Pearson, of Newcastle University's Institute for Cell and Molecular Biosciences, said: "We're just not eating enough fibre, yet we need this to keep us healthy. "We believe it's hard to change people's habits and that the most practical solution is to improve the food they do eat. With pork pies, one of my favourite foods, it could replace the gelatine which usually covers the meat, as the seaweed extract has gelling properties too." Prof Pearson, who has already made loaves of bread containing the seaweed extract which passed the taste test with colleagues, added: "Bread is probably the best vehicle to reach the general population because most people eat it. Adding the seaweed extract could quadruple the amount of fibre in white bread." Information about seaweeds and alginate from Wikipedia, the free encyclopedia: Seaweeds are used extensively as food by coastal peoples, most particularly in Japan but also in Korea, China, Indonesia, Peru, the Canadian Maritimes, Scandinavia, Ireland, Wales, Philippines, and Scotland, among other places. For example, laver is a red alga used in Wales to make laverbread, and in Japan dried, formed into sheets called nori, and used to wrap sushi. Irish moss is another red alga used in producing various food additives. Seaweed is also used for the production of Alginate, a versatile product that is used for a whole range of applications. These include the production of Agar which is used very widely in microbiology as a substrate for culturing organisms. Alginates are also used in the production of foodstuffs to improve texture and mouth-feel. Typical products are ice-cream and a range of proprietary desserts. Alginic acid (algine, alginate) is a viscous gum that is abundant in the cell walls of brown algae. Chemically, it is a linear copolymer with homopolymeric blocks of (1-4)-linked �-D-mannuronate (M) and its C-5 epimer α-L-guluronate (G) residues, respectively, covalently linked together in different sequences or blocks. The monomers can appear in homopolymeric blocks of consecutive G-residues (G-blocks), consecutive M-residues (M-blocks), alternating M and G-residues (MG-blocks) or randomly organized blocks. The relative amount of each block type varies both with the origin of the alginate. Alternating blocks form the most flexible chains and are more soluble at lower pH than the other blocks. G-blocks form stiff chain elements, and two G-blocks of more than 6 residues each form stable cross-linked junctions with divalent cations (e.g. Ca2+, Ba2+, Sr2+ among others) leading to a three-dimensional gel network. At low pH, protonized alginates will form acidic gels. In these gels, it is mostly the homopolymeric blocks that form the junctions, where the stability of the gel is determined by the relative content of G-blocks. 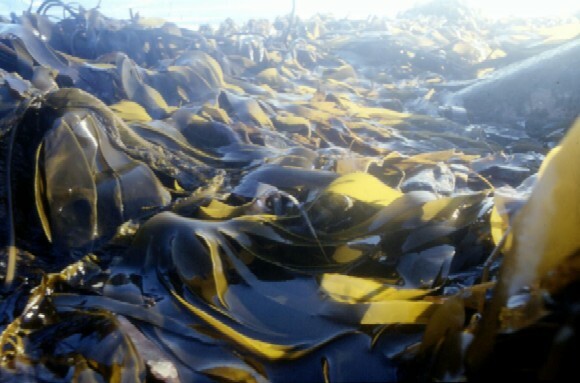 Commercial varieties of alginate are extracted from seaweed. Certain bacterias, however, also produce alginate. Alginate ranges from white to yellowish brown, and takes filamentous, grainy, granular, and powdered forms. It is insoluble in water and organic solvents, and dissolves slowly in basic solutions of sodium carbonate, sodium hydroxide and trisodium phosphate. Purified forms of alginate are used in antacid preparations such as Gaviscon�, Bisodol�, Asilone�, and Boots Own� tablets. Alginate is used extensivly as a mold-making material in dentistry and prosthetics, and in textiles. It is also used in the food industry, for thickening soups and jellies. Wikipedia information about seaweeds and alginate in this article is licensed under the GNU Free Documentation License. It uses material from the Wikipedia articles "Alginate" and "Seaweeds".